Kopron, a company at the core of great projects around the world, specializing in particular in solutions and products for industrial logistics, have redesigned their digital identity through a new website: www.kopron.com in 7 languages. 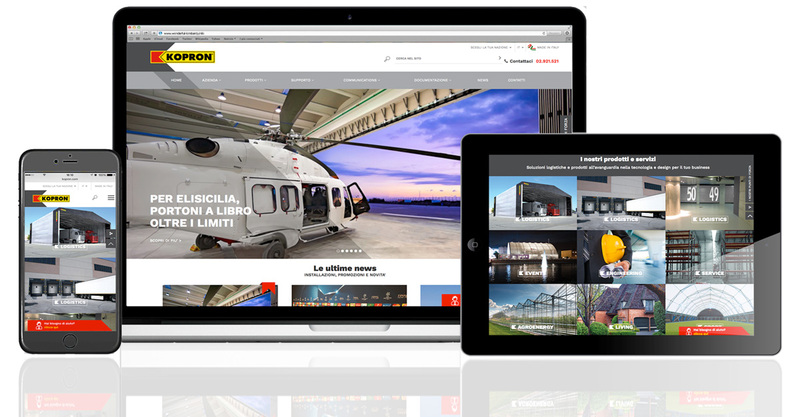 This platform enables visitors to have a complete overall view of Kopron world: Kopron Logistics, the core business of the company including retractable warehouses, loading bays and industrial doors. Kopron Engineering, which offers project management, engineering and construction services either for Kopron products or any other building project. Kopron Service, is the aftersales dpt for assistance and spare parts. Kopron Sport proposes warehouses for sport applications plus accessories. Kopron Events, hire or sell warehouses for events. Kopron Living for garage doors. Kopron AgroEnergy, Kopron’s ‘green’ division which offers ‘turnkey’, energy saving solutions for greenhouses. This renovated website has a clean, up-to-date design and is very easy and interesting to surf. Home page welcomes visitors with images that well illustrate the products, and inside the site one can find all the business units of the company, by hovering over with the mouse you can see colours and writings describing the products. Surfing from home page onwards, visitors will be accompanied by a pleasant game of colours: each division has its own colour. You can also find details on each product, thanks to links leading you directly to catalogues, videos and other information. Communication in Kopron is fundamental and could’nt have missed in this new website! You can find the story from 1982 todate, on how Kopron have always been close to the most important International soccer teams: they have sponsored for 12 years F.C International, and in recent years they have supported National Italian Soccer team and others like Torino Calcio (Turin soccer club). You can read more through the social walls: social posts aggregated into one easily manageable page. Installations made around the world, are a focal point of the website and considered the best case history of the company. Customers have given their contribution by telling their stories and positive experiences with Kopron. So each division and product are provided with relevant testimonials. Very soon online, there will be a reserved area dedicated to professionals and customers, where documents such as certificates, manuals and specifications will be available for download. www.kopron.com website has been redesigned with latest technology in order to be compatible with all devices and updated browsers. Design has been developed by agencies PSF Interactive and Diamantea – Innovative Web Selling Tools.